Yeah, I mean, it was in every copy of the 2003 Takanuva set. Even considering that I had it on hand last time I posted in here, I left out any mention of my Pearl Gold Mask of Life. Nowadays, the top spot goes to my transparent dark blue Noble Ruru, which only ever appeared in the 2001 Nui-Rama set. It's for sale though - I'm trying to raise some funds for something even better. Just gonna post a pic of my rarest masks and head pieces, although it might be a bit subjective. Irnakk's head piece in surprisingly good condition (I got it from a lot i bought online from a non-BrickLink site). Dark gold Visorak Keelerak headpiece (I own 2). Chrome silver Hau (probably one of my favourite masks in my possesion, I even built an altar for it). Dark gold Kraahkan (I would kill for one in pearl gold). Special Kraahkan (the one from the Takutanuva set). Mutran and Vican's masks in mint-condition. Nocturn's headpiece (1 of 2). White Takadox head piece, sadly in quite poor condition. 2 variants of the infected Hau Nuva. All 6 Toa Nuva's masks in silver (got the last 2 today, really happy with this collection). Trans-orange Mask of Fire (G2). Still find it strange that the silver Nuva masks are that expensive - as far as I've seen on bricklink each of them costs between 20 and 40 bucks. I mean, that's insane! You can get a complete '01 mask collection for about 200 bucks as a comparison. I found my silver Nuva masks quite "cheap", around 12 to 16 dollars. This one came from the fan media days that Lego hosted a while back. I was invited to go, but unfortunately due to the timing being so last minute, I didn't end up going- the person who went on our behalf was kind enough to send me the bionicle goods that were handed out. I've also got about 24 of the trans neon green skull Scorpio masks and some of the gold Kulta mask polybags (also came from the above situation) which round out my rarest mask collection I suppose. And "only" cost me about one and a half years and 150 bucks. For 150 dollaridos, they better be in a sealed glass case. Wait, 08 takanuva is hard to get? I'll count myself lucky then. If you check BrickLink for the Gun metal Takadox headpieces, you can see that like 9/10 are from the US and Canada, so here in Europe it was a very rare set or, like you said was the case in Germany, not sold at all. I have seen '08 Takanuva in a physical store after G1's cancellation, sold for around 350 dollars. It is a set that I've always wanted, but that is a price that I'm not gonna pay. The weird thing is that I actually saw '08 Takanuva displayed in Legoland Günzburg - as well as Icarax - but neither of them was sold. Through bricklink I bought the parts for Icarax and most of those for Takanuva, though... I'm mostly only lacking the set specific parts to complete Takanuva. Which is basically everything gunmetal grey. Lhikan's Hau, Copper Huna, honestly that's it. Does my Infected Hau count? 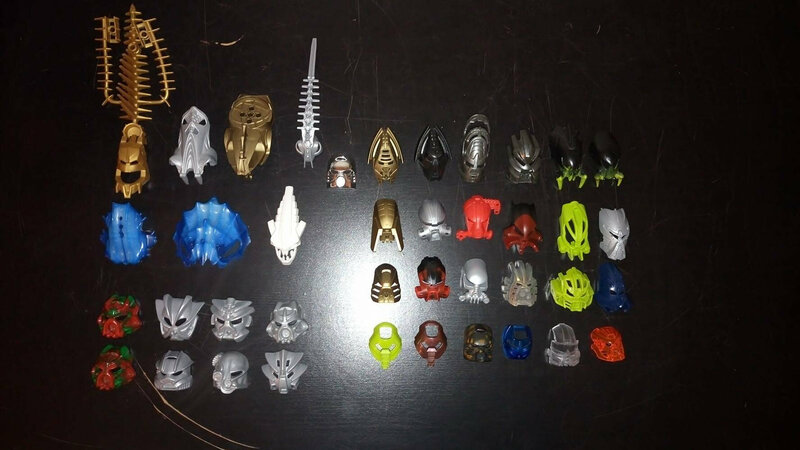 I slso also have also have both toa Haga masks, and Lesovikk ' mask. @WhatCameNext I have a Gunmetal Takadox headpiece, I'd be willing to sell it too. yes they are. 6 by 3 grid, each chunk being 2 by 4 grids for the breed, with each horizontal row alternating between 2 masks. I think they're laid out in 2X4 blocks of the same color, with the Kal in the top row, the standard in the middle, and the Va in the bottom one. The Krana breeds in each block are laid out in the same way, and in each "column" the element is kept consistent. I think it's a neat way to put them because you can photograph them all at once without crazy angles. so you don't overlook things like this. It's the Avohkii, and it isn't really, to be honest; it was included in every copy of 8596 Takanuva. Still cool though. I have the gold mask from Titan Mata Nui. Because I am totally fabulous. Does my Infected Hau count? I own a Black Huna now, so that's probably topping my list. You lucky devil, I've been trying to get a misprint Huna for years. What other rare masks do you have?